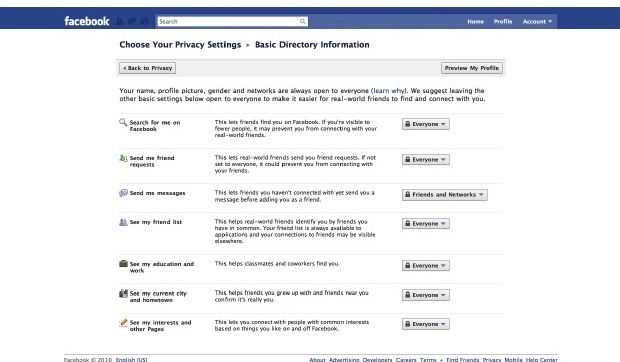 Facebook’s complex, ever-changing privacy settings have angered many a loyal user. Now the social networking site is hoping to undo some of the damage with a new policy intended to make privacy controls simple. 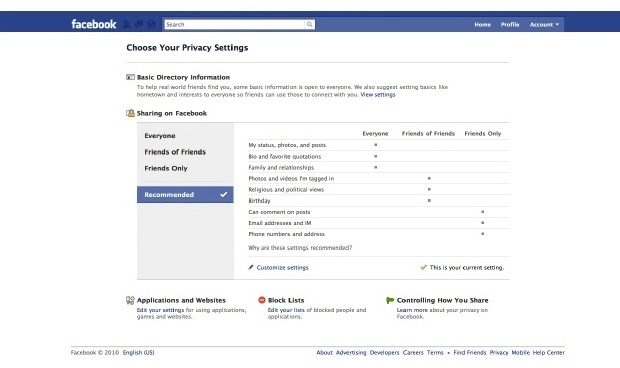 Previously, Facebook had 50 privacy controls; now it has approximately 15. The changes, outlined in a blog post from CEO Mark Zuckerberg, include one-click controls to set who can see private content, the ability to control who can see users’ friends and pages, and a simple control to set whether applications and websites can access personal information. Users can opt to turn off Platform completely, so that all sites and apps are blocked from seeing personal content. Instant personalization can also be turned off–a move that keeps partner sites from viewing even users’ publicly available information. On a personal note, I just turned 26 years old a few days ago. I started Facebook when I was 19 and it’s amazing to look back at how it has evolved. There have been a lot of changes over the years as we’ve continued to innovate, and I appreciate that you have all stuck with us. Each time we make a change we try to learn from past lessons, and each time we make new mistakes too. We are far from perfect, but we always try our hardest to build the best service for you and for the world. So I just want to say thanks. Call us gullible, but we actually believe that this is a genuine attempt to make privacy settings simple. But in a press conference call, Zuckerberg made it clear that his views on privacy haven’t really changed: “There are models/views in the world that people want info to be as private as possible. I don’t think that’s what users want. We’re sensitive about it. We really do believe in privacy, giving people control. There’s a balance, more and more people want to share information.” It’s a tough balance to maintain, and we wouldn’t be surprised if Zuckerberg slips up again sometime in the near future. At least Facebook’s new changes may placate its user base for the time being. Ariel Schwartz can be reached on Twitter or by e-mail.